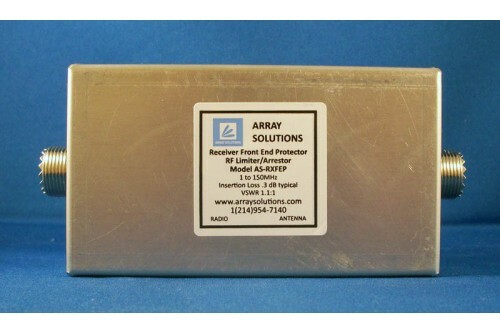 AS-RXFEP - Receiver Front End Protector. 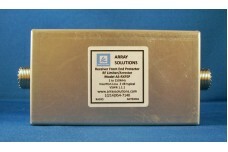 Protects your preamp and radio from excessive RF and lightning (Replaces ICE 196 and 197 RF limiters/protectors). Strongly recommended for receiving antennas/systems. 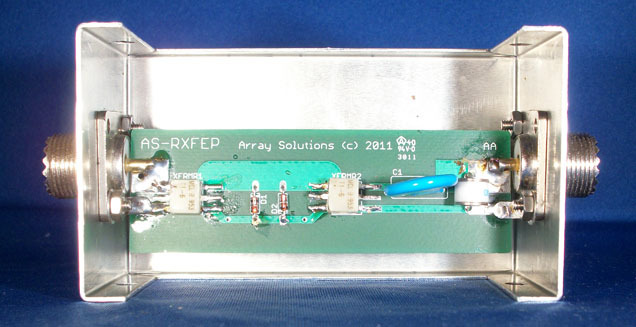 The AS-RXFEP Receiver protector limits input RF signal threshold from 1 to 150 MHz to less than 0.3 V rms to protect a receiver front end from damage due to nearby transmitted signals. The receiver still acts normally and measured signal strength is not affected. The circuit uses a multi-stage design of transformer saturation coupling and current limiters. It also incorporates a low voltage GDT to protect from lightning events. These are for receiving only - you cannot transmit through them without damaging the unit. The model AS-RXFEP consists of a high voltage blocking capacitor input, two impedance converting broadband transformers and low-capacitance limiter diodes. The circuit is constructed to transform the 50 or 75 ohm input impedance in a broadband configuration where the diodes limit the applied signal to about 0.5 V. The signal is then transformed back to 50 ohm for the output of the device. The AS-RXFEP has a well chosen limiting point and features “soft limiting”. Part of the soft limiting function is achieved by series resistance which introduces some insertion loss. A small amount of insertion loss is not a problem in most applications. Each of the components in the design serves a useful purpose. The onset of limiting (-1.0 dBm) is approximately 4 dBm below the beginning of blocking for most modern radios. The maximum output (+10 dBm) is a few dBm below the damage threshold of common transceivers like the FT-1000MP. Note the range from first limiting to maximum output is 11 dB. (Read this as “soft limiting"). The user can adjust the series resistor to adjust the soft limiting point for protection of front ends that may be more or less robust. When large signals are presented to the unit the input transformer saturates instantly, an increase in input VSWR occurs, and the balance of input signal is reflected back toward the source. For this reason power handling capacity is mostly irrelevant. But even so, the components can handle approximately 10 watts ICAS. Impedance of other signals at lower levels is undisturbed. Insertion loss from 1 to 75 MHz is typically 1 dB. Limiting begins and holds at approximately .7 volts RMS. Or approximately 10 dBm. +5 dBm is 80 dB over S-9. This level of RF is not often present in most single operator stations. In a multi-operator station it is possible to see these levels on incoming RX antennas with no band pass filters in line or where more than one station is active on a single band. To limit the RF overload. To prevent the RF from other bands getting in and to further block any possible harmonics from the reflected RF from the AS-RXFEP back out to the antenna. SO-239 connectors. Use adaptors to RCA or BNC connectors to avoid accidentally connecting it to the transmitter output. You can test and see yourself how the AS-RXFEP front end protector works and its power handling and proper functioning easily. Attach a dummy load to the RX side of the filter and connect your transceiver to the antenna side. Slowly bring up the power from, say, 1 W to around 10 W and monitor SWR. You will see the SWR at low levels be 1:1 and once limiting start it will climb to infinity as the transformers saturate and finally the diodes clip. This RF is reflected back to your transceiver and is indicated as high SWR. The transformers and the soft limiting circuit used also provide circuit isolation which prevents extraneous diode detection effects. The following pictures demonstrate the soft limit circuit. Output of AS-RXFEP with small signal 120mv peak to peak - no effect on signal. Soft Clipping-note the output signal has been limited and it is not a square wave. It is rounded. The soft clipping reduces the harmonics and IMD products of a hard diode clip circuit. The input level is about 10-11 dBm which is the threshold many modern day receivers for no damage. Some transceivers can take 13-15 dBm. No matter how much more signal is applied the output will not go over this level. The transformers are in saturation which causes a high SWR looking into the AS-RXFEP from the Antenna. The overvoltage energy is reflected back out to the antenna or filter if used to be in front of the AS-RXFEP device. The next picture is with about 13dBm of RF being applied to the device. Remember that +5 dBm is 80 dB over S9!! The limiter is holding at the maximum level it will allow through, which is under the damage level of most modern rigs. You should never see this kind of RF coming down your RX antenna, but if you should you are protected. There are some rare locations for instance a station next to a high power broadcast station that may receive more then 13dBm of RF and it may be possible to get IMD products. This is when the series resistor can be increased to bring the soft clip back into operation. The use of broadcast band filters also is a way to address the overload into the front end protector. Even 10 watts of power into the limiter will not damage the front end protector or your radio. Use these devices for all receivers, specially the new broadband super-sensitive solid state units. 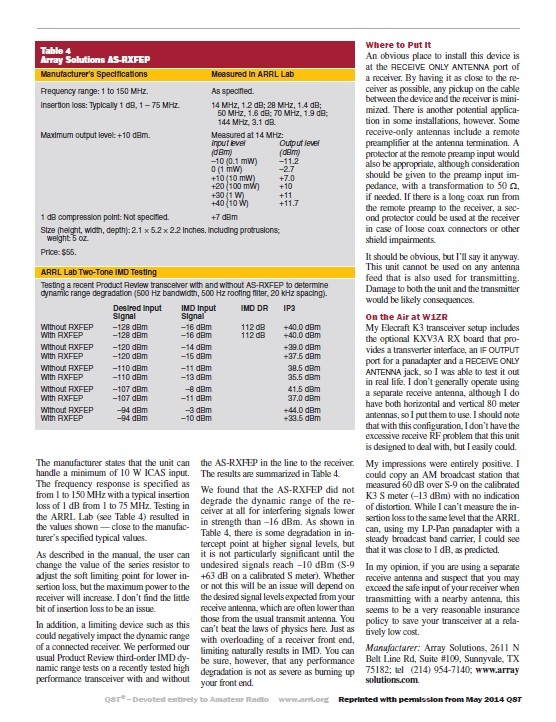 Download the data sheet of the AS-RXFEP, click here. 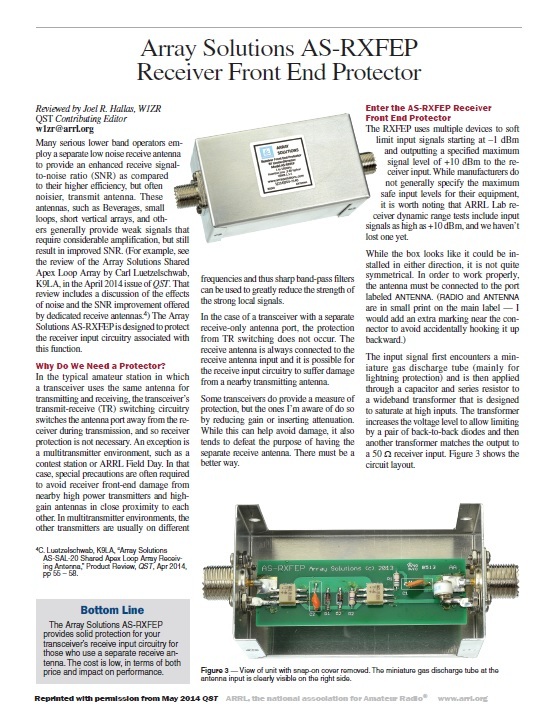 NOTE: Article Courtesy of the American Radio Relay League's QST magazine.